I am going to start this post off by clarifying the title – real title should be “When Posts Go Viral (whatever viral looks like in your world). For some, that looks like 100 hits on a post in one day. For others, that number is in the six figures. For me, viral means that a post has had unusual success on Pinterest and directed a crazy amount of traffic to my blog (the viral post has been pinned over 6000 times, which is pretty big for me). Re-read that thing! Go back and read your post with a fresh set of eyes. Is it well written? Could you add anything? Are you fine with it being seen by a ton of eyes? Make any changes or updates that you’d like to make. Link to other posts! If your original draft did not contain links to any of your other posts, add one or two now! The goal is to retain some of your new audience and the best way to do that is to showcase a couple more of your blog posts that they might resonate with or find helpful. A part of this is also make sure you are continuing to pump the viral post – if it’s gone viral once, it will probably go viral again. I manage all of this through CoSchedule (affiliate link) but whatever mechanism you use to schedule posts should be sufficient (but CoSchedule really is fantastic if you haven’t tried it yet!). If you have any affiliate links, you might want to include one if it’s relevant. I added an affiliate link to my post that was relevant – I shared my favorite shorts to layer with in cold weather. You really want to utilize the upswing in traffic while it lasts! 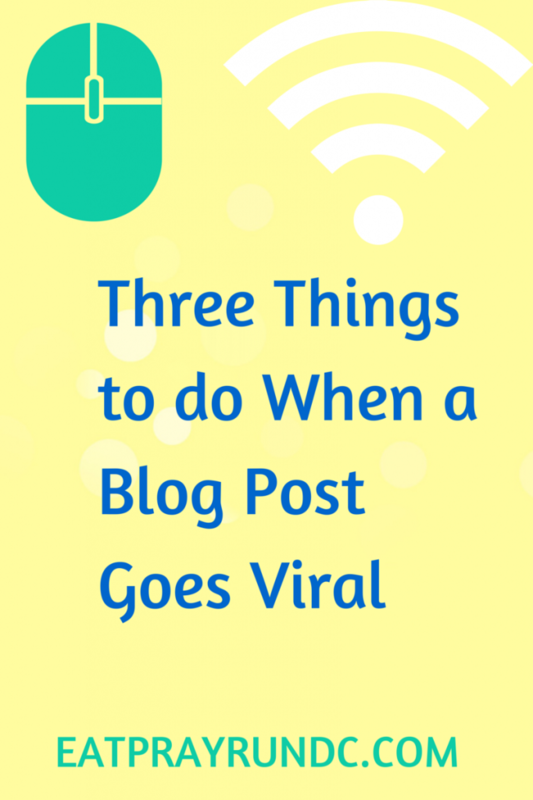 Have you had a post go viral? Did you do anything different? Yes to all of these! I had a post go viral while I was at ZOOMA last spring and there was not a single link to another post in it. D’oh! By the time I was at a computer, it was too late to capitalize on my 15 minutes of fame LOL. yeah, it’s so quick — but you should go back and add a link. my viral post is back for the second round of crazy traffic! I had my first post go viral right before Ragnar. I was so excited I didn’t know what to do! I didn’t have anything else to link to it because it was my first Ragnar. Great idea to go back now and link up another post for future readers. Thanks again for the tips! yeah, it’s kind of like…”uh, should i be doing something? ?” 🙂 i felt the same way! Great tips!! 6,000 times pinned? That’s amazing! yeah, it’s kind of crazy! I still can’t really determine what “viral” is! But dang, you must be on fire if a pin was pinned 6,000 times. How can you tell how many times it was pinned? Also, out of all those pins, how can you tell how many people actually clicked on the link? I admit, I pin lots of stuff with the intention of reading it later but sometimes I forget and never go back to read it. there are ways to tell this from pinterest but it’s a long explanation. i use sharing links at the bottom of each of my posts and those links display how many times a post has been tweeted, shared on fb or pinned. if you click on the post i linked to and scroll down to the sharing icons, you’ll see that it has been pinned 6.45k times. as far as who has clicked through, that’s very obvious – when i see my traffic spike (like 10x normal) and see what the most clicked post, it’s very clear to me that LOTS of people are clicking through that pin! As usual, all great tips Courtney. When I go back and reread posts, I often find an idea that I forgot to include when I initially wrote the post, or sometimes a spelling or grammatical error that I missed when I originally proofread it. Anything and everything you can do to retain your new audience is so important! your last sentence is basically what it’s all about 🙂 thanks for sharing this post, btw! These are great suggestions – I really would have never thought for doing those! Congrats on the hot post and thanks for sharing your lessons learned! thanks for reading — I didn’t think about any of this stuff the first time it happened, either! These are all super helpful,thanks for sharing. I wouldn’t even know what to do honestly…I would probably treat it the same as a normal post. yeah, i totally had no idea you did anything…until it happened for the second time. hindsight is 20/20! thanks for reading! this has happened to me a few times – particularly with a post i wrote about tapering a week before a half marathon. apparently titling it “Last long run before half marathon” gets a lot of search engine hits! these are super great tips. i should go back and polish that thing, cuz it happens about once a month. nevie recently posted…How I feel. yes, definitely go back and do it – it takes no time at all and i think it’s really worth it! I posted a bingo board for Scandal a while back, and it spikes whenever the show airs. I need to get better at capitalizing on it! Thanks for the suggestions! that is a genius idea — definitely go back to that post before thursday!! Wow! That at is awesome. I am new to all this blogger stuff so I can only dream of getting a viral post at this time! it’s so funny because you never know what will take off! i know! i need to find a way to schedule pins – i wish coschedule would get pinterest back! Duh…. I feel pretty silly for not thinking of this myself. Of course I want to capitalize on the success of one post. thanks haley – it makes so much sense but i didn’t think of it until the second time it happened! I had on Instagram challenge post go viral. I could add sign up for the best big ad networks you want to get in while your numbers are WAY up. 🙂 That is what I did. Define “viral”?? ha ha ha! I am proud of all of my posts and they get enough views for my liking, that’s all that matter to me! GiGi Eats recently posted…Joan Rivers: A Toast To You! These are great tips. Your pinterest trip from a previous blogger tuesday (and related today) is on the top of my to do list. By any chance do you remember how to get added to the Sweat Pink Pinterest Group? Do I email Jill? hmm, i think so. if you go to the pinterest board, i think it has the instructions. or just search the fb group – that’s where i first read the instructions! You always have such great ideas, thanks for sharing. Good work on the 6K pins!! you should be able to look at your stats and see what post brought in the most traffic – then you can see the referrers for that post! Hi, I haven’t had a blog post go viral yet but I often wondered what I should do if one does. Thanks to you, now I know! These are really good tips. so glad you found this post helpful! I have a few posts that keep getting spikes due to Pinterest as well, hadn’t thought about the affiliate links! Thanks for the tips!! And congrats on a great post!! Good idea, I will do that – thanks! Pinned! Hopefully I’ll be back to use this awesome advice someday! thanks for pinning 🙂 i hope you use these tips one day soon! That is incredible. I haven’t really had anything go viral, but some of the bloghop posts I do get a few thousand. But I don’t really know if I should count that:) I really need to utilize Pintetest more. I know your post is what to do if you go viral. But this wad also awesome advice on a way to go viral. You never know if something you pinned will get picked up like yous did after the fact, but the key I am taking from this is use social media, because you never know. This is pretty cool congratulations and thanks for the tips!!! the reach of that post has really blown my mind! thanks for stopping by kristy! Just read this linked from your monthly income report – thanks for the tips! I have had a post go nuts on Pinterest lately, and had another go viral (for me) about safety tips for runners after I was grabbed. I will go re-read both posts! Two weeks ago before switching over to WordPress, Blogger stated I had 2,347 page views in one day. For the life of me I couldn’t figure out what drove the traffic to my site because nothing I checked verified that total. It was probably a glitch, but it was pretty awesome even for a glitch. I have a post going viral RIGHT NOW!! EEK thank you!! I have had over 80,000 views in the last 4 days. I’m freaking out. It’s a fairly new blog and I have no idea what I’m doing. There was something wrong with my subscribe button for a couple of days so I missed a big opportunity there. That is now resolved. I refer to previous blogs but don’t have any links. I will do that today! Thanks for the tip! These are great tips! I wouldn’t have thought of any of them. As always thanks for sharing!